“This menhir is situated about 500ft west of the head of the Harbourne stream. It is not indicated on the first edition of the 6 inch O. S. sheet cxiv, sw. But a bench mark is given (1123.7) which is in fact cut into the stone. In contrast to the Beardown Man, which tapers but slightly towards the top, the profile of this stone is triangular. The length of the stone above ground is 8ft 1 in., its width at ground level 3ft 7in., and its thickness 13in. on the one side and 10 in. on the other. Its greatest width a little above ground level is 3ft 3in., and its greater thickness 11 in. The stone leans considerably to the west“. It seems over the years the Dartmoor weather and grazing animals have somewhat eroded the peat because in 1983 Hemery sets the height of the menhir as being 8ft 9in. above the turf. The ADS record lists the stone as standing at 2.4m (which in old money is 7.87ft) in 2004, so it would appear that either Hemery got his figures wrong or having shrunk the peat has now expanded? One thing he definitely does get right is a wonderful description of the site: “… seen when dimpsey (dusk) falls, its outline assumes the semblance of a huge dagger“, (1983, p.605). Indeed, in some letterboxing circles I have heard the menhir simply referred to as ‘The Dagger’ which probably derives from Hemery’s description. Is there any significance to the shape? Petit (1974, p.147) seems to think so, he suggests that the triangular shape may represent the female symbol that can sometimes be found in stone rows. But what of the stone’s context in the landscape of the Bronze Age? The aerial map opposite shows the immediate area around Harbourne Man and as can clearly be seen there are numerous cairns dotted around and the vestiges of some small settlements. Therefore there can be no doubt that Harbourne Man is set amidst a Bronze Age landscape of occupation and ritual, but what part of the ritual did the stone play? Could it be significant that the standing stone was sited near the head of the Harbourne River? Were the people involved in some kind of water cult? About 1½ miles south of the stone is ‘Bloody Pool‘ it was here that what has now been described as a Bronze Age merchant or founder’s hoard was discovered. Comprising of four bronze spearheads and ferrules it has been suggested that they formed some kind of votive offering and were placed purposefully into the one time pool. On Dartmoor there are basically three menhirs that have been fairly positively categorised as such, all are remote and fairly well detached from any other major feature such as a stone row or circle. Beardown Man is remote and the nearest water source is about 845m away, The Hangingstone again would have been remote and is roughly 692m from the nearest spring. Harbourne Man is hardly what one would describe as being remote but it’s only around 118m away from the head of the Harbourne, was this for a specific purpose? Was the stone intentionally fashioned in a triangular fashion to represent a female? Was that female some earth goddess? Was the head of the river seen as some portal between the world of the goddess and the world of the living? In which case maybe the stone should be called ‘Harbourne Woman’. Was the stone deliberately designed to look like a dagger? If so did it act as some tribal boundary that gave out a clear message of hostility to any interlopers? Was the menhir some kind of marker for astrological observations? Or was Harbourne Man simply a memorial to somebody or some family of note? Like the other menhirs we shall never know or maybe just not yet? 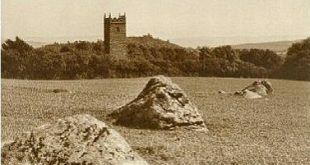 Again in common with other Dartmoor menhirs there is no folklore or superstition attached to Harbourne Man, he does not even go down to the river to drink at midnight. Hemery, E. 1983 High Dartmoor, Hale Publishing, London. Petit, P. 1974 Prehistoric Dartmoor, David & Charles, Newton Abbot.